Low level moisture trapped over the region will keep clouds in place through Friday, but sunnier skies and warmer temperatures are expected Saturday. High pressure is building into the Finger Lakes from the southwest, but it will not be immediately obvious. This high pressure is centered over the Ohio Valley this morning. 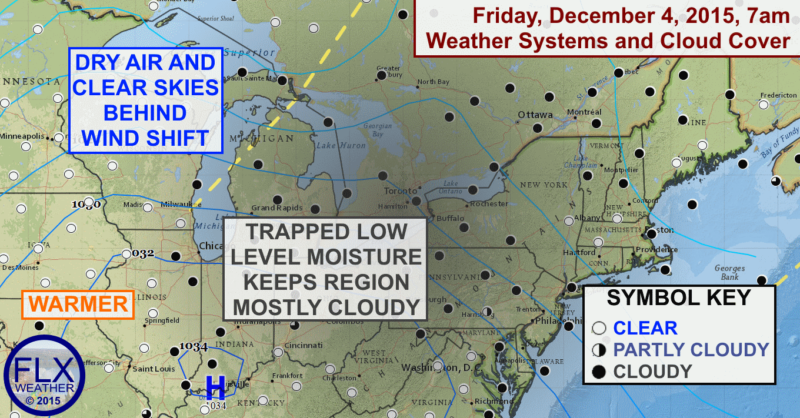 However, in the wake of this week’s active weather, a large amount of low level moisture remains locked in place across the lower Great Lakes. This low level moisture is manifesting itself as thick clouds. These clouds will likely remain in place for most of Friday. A wind shift, denoted on the map by the yellow dashed line, is dropping southeast through the Great Lakes. This boundary will clear the moisture out with sunny skies in its wake. The clouds across the Finger Lakes will start to break up overnight, and skies should be mostly clear by Saturday morning. Any lingering clouds should quickly move out. Sunny skies should persist through sunset, with a mostly clear night Saturday night. Clouds will thicken back up on Sunday, and most of the next week is looking cloudy. Despite the clouds, very little in the way of precipitation is expected until later next week. For temperatures, Friday will still be a bit on the cool side. The clouds will help keep temperatures from getting much past the low 40s. Warmer air is already starting to work in aloft though, and with the sun on Saturday, it should be much warmer. Highs on Saturday should be in the upper 40s, and a few spots may be able to hit 50 degrees on Sunday. Cooler air will seep back in for next week, with highs most days between 40 and 45 degrees.